I will admit I am not much of a gardener. I may come from a long line of farmers (my father being the one closest to me) and a long line of green thumbs (my mother famous for her ridiculously huge gardens where she could grow pretty much anything) but it does not seem the gift was passed along to me. I may be part-owner of the family farm, still in our possession years after my father’s death, and I may be a dabbler in growing things, but I am not by any means a horticulturalist. I am, however, someone who understands our intrinsic bond with growing things. Perhaps it goes back to our hunter-gatherer past when our survival depended on the foods we could hunt or forage. Perhaps it goes back to when we developed the idea of growing our own food as opposed to foraging, a practice that quickly led to growing things not only for consumption but for pure pleasure. I don’t know where it comes from, but I recognize and feel the bond with things that grow, from houseplants to shrubs, which I suppose is how I ended up joining the Communities in Bloom Committee. Communities in Bloom is a remarkable local organization that encourages residents to not only grow things but to improve our communities through responsible stewardship of our resources and encouraging sustainable practices. Communities in Bloom is about so much more than simple beautification, but creating beauty through our plants is part of it, too. Every year Communities in Bloom selects a “flower of the year”. This flower becomes the one they not only encourage residents to grow but is the one for which they package and provide seeds, handing out the seed packets primarily at the Fort McMurray Tourism Spring Trade Show. 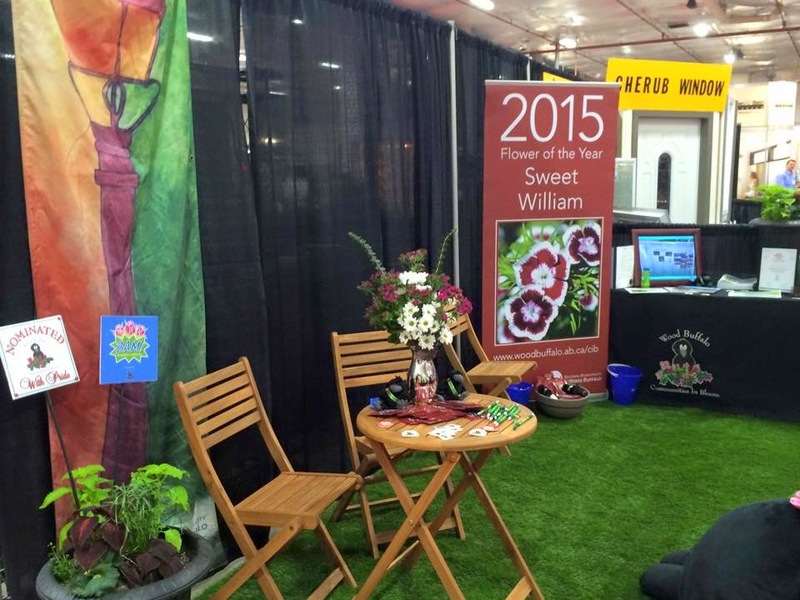 That would be how I found myself filling 1,000 seed packets for a lovely little flower called a “Sweet William” and then handing them out at the trade show. 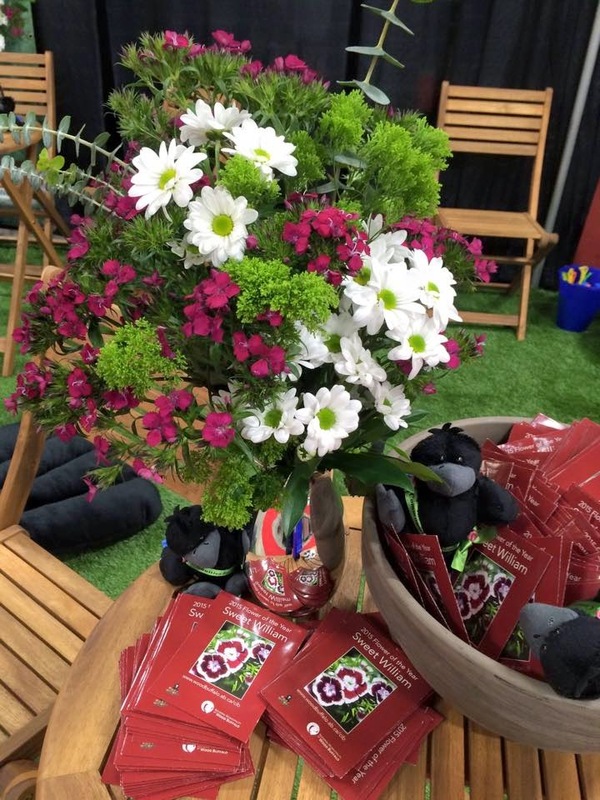 There are things that might be a hard sell at trade shows – non-stick pots and spin mops, perhaps, but free flower seeds might just be the easiest sell in the world. 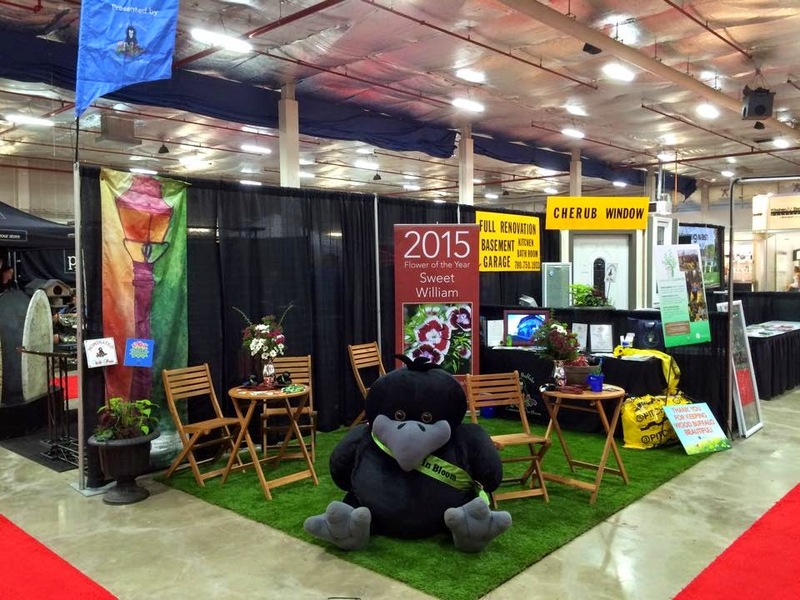 The Communities in Bloom booth was pretty eye catching, what with Rave the giant stuffed raven perched at the corner, but it was when people saw the flower seed packets that they would stop. “Sweet Williams,” they would exclaim, and then these complete strangers would follow with a personal story. Maybe they grew them “back home”, or their mother did. Maybe they already had a few of them in their yard or maybe they had only just seen them and never grown them. I do know, though, that I handed out hundreds of packets of flower seeds, the ones packed by me (with help from Sirius Black Cat of course) and the other members of the committee. And every single person who saw the seed packets smiled, because there is something about a cheerful little flower that makes you smile. And the Sweet William is a cheerful little flower, delicate in appearance perhaps but quite hardy in reality. It is a tough little plant, often stubbornly self-seeding so that it returns every year despite snow and cold temperatures. It is tougher than it seems, withstanding difficult conditions and able to flourish despite challenges. It reminds me a lot of someplace, actually. It reminds me of Fort McMurray. I was thinking about it as I was handing out seed packets over the weekend. Fort McMurray is not really a place for the faint of heart. Oh, we are quite gentle in appearance in some ways as there are those who think we are the land of milk and money (my own twist on an old term) but who do not realize how hard we must work to make that money. One must be hardy to thrive here, able to withstand challenges while embracing opportunities as they present themselves. During this period in our history we are facing some uncertain times but there is one thing I do know: like the Sweet William we will not only survive, but thrive. This weekend the Communities in Bloom committee on which I now proudly serve handed out thousands of seed packets for a beautiful little flower that is deceptively tender looking, hiding its hardiness and toughness under soft petals. I found the entire experience remarkable, blending my adoration for this community with my fascination for how things like flower seeds can spark conversations and memories of times gone by both here and in other places we have known and loved. It was one of those moments in my life here that became far more remarkable than I ever thought it could be, and I must admit there are a few Sweet William seeds waiting to be planted at my house too, joining my other attempts this year at beautification including the hanging baskets of petunias that I cannot be without every year. This year, though, I plant knowing that I am doing so not only to beautify my life and neighbourhood but in homage of my family past, too, a legacy of farmers and gardeners. Even more than that, though, this year I plant to honour this community, a place where the hardy not only survive but thrive, and where a packet of seeds can become the connection between complete strangers and make us a community.